We worked with Lewis’s parents and our highly skilled stonemason to create this very special stone for their beloved son, who tragically lost his life, aged 15 years. 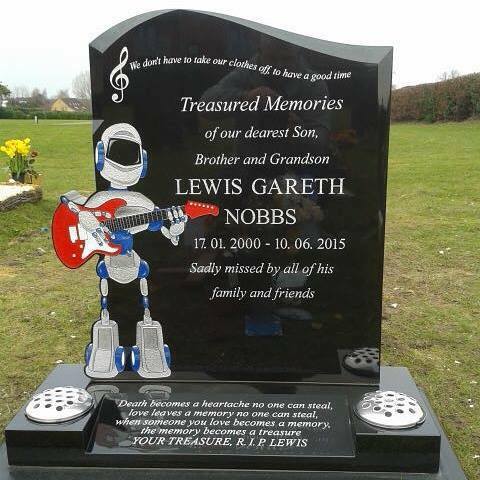 Two of Lewis’s favourite things were his love of music and his favourite dance move, the ‘robot’ - we feel this memorial sums that up perfectly. We have been running our memorial business for just over 20 years and have kept ‘up with the times’ to ensure that any requests from our clients can usually be met. Our memorials are made using either hand tools to etch the design or for a more detailed and precise image, a computer and specialist laser. A memorial stone is a lasting and very special tribute to the person you have lost, and we have found, especially in recent years that more and more families now want to make the memorials more personal. It is important to point out however, that the material of the stone and indeed where your loved one is laid to rest can significantly affect your choices. For example, if you want a memorial stone for a churchyard, beside a church, black and white stones are not allowed, neither in the main are any stones which are polished, or indeed many types of image. Cemeteries tend to be a lot more lenient although it is common for there to be certain rules regarding the sizes of memorials accepted. During appointments made to discuss memorial stones we guide people through all the ‘rules’ and during the process we ensure that all permissions have been applied for with either the church or the council and that the stone is erected with care following all the relevant health and safety constraints. The hardest decision for most people is the wording or ‘epitaph’. Again everyone is different and while some people prefer to keep the wording simple, others request poems, quotes and occasionally humorous messages. We understand how important it is to get the wording right, after all, it is a lasting memorial. There are many decisions to be made when ordering a stone, but we hope to make the process a little easier. Please contact us if you would like more information or to make an appointment.